Carpets get dirty and sometimes all you can do is call for deep cleaning services. If you have ground-in dirt or stains, then deep cleaning is often the best option. However, you should invest in annual deep cleaning services to keep your carpets truly clean and prolong their life. Stains are nearly impossible to remove, but you don’t have to live with them. Stains like pet urine soak deep into carpet fibers. As the upper levels dry, the urine in the lower sections will wick up toward the surface. This is why some stains continue to reappear long after you thought they were eliminated. However, deep cleaners can reach down to the lowest levels of the fiber and remove the stains from all levels. Most residential machines don’t have the power to accomplish this, but commercial systems have the suction power to truly clean carpets and permanently remove stains. Like stains, allergens drift into the carpet fibers. While some are vacuumed up, others stubbornly remain behind. These fibers shift and move every time you walk across the carpet. They can drift through the air and cause misery for anyone with allergies. This is why seasonal allergies continue to bother some people long after the pollen levels outside have dropped. Regular vacuuming goes a long way towards removing the allergens, but only deep steam cleaning will completely remove them and provide you with the relief you need. These microscopic invaders survive by dining on the dust in your home. The problem is that they leave behind feces and body fragments that are extremely irritating to people with allergies. They are inhaled when people walk through the area and disturb them, but you can avoid the problem by having the carpets deep cleaned. Do you ever walk into your clean house and notice a faint odor? The problem may be mildew that is starting to spread under your carpet. It comes from the moisture that is tracked into your home when it rains or snows. The good news is that deep cleaning can eliminate it. 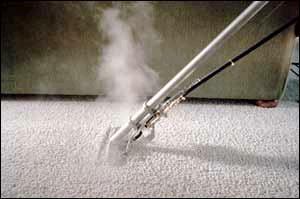 With deep cleaning, you will also prolong the life of your carpet. Carpeting simply lasts longer when it is cleaned on a regular basis. The dust that acts like sandpaper is removed, and dirt is cleared away before it can stain. Greasy residues are broken down and eliminated before they cause the carpet fibers to crush down and start looking worn. Your carpet will last longer, and that helps you save money in the long run. Invest in annual deep carpet cleaning services in New Jersey to keep your home clean and your carpets attractive. Available from professional companies like High Quality Carpet, these services ensure that your carpet is truly clean and looks great. Your carpets will last longer, and you will avoid problems caused by dust, allergens, dust mites and even mildew. Call today to schedule your appointment and enjoy having beautiful clean rugs and open sinuses once again.